The title of my last blog entry (for now!) about the Azorean archipelago comes from Pedro da Silveira poem’s title ‘The Island and the World’, picturing perfectly the remoteness of the island of Flores. Flores is one of two islands in the Westernmost part of Azores, and it was the last stop in my last year’s journey around the archipelago. 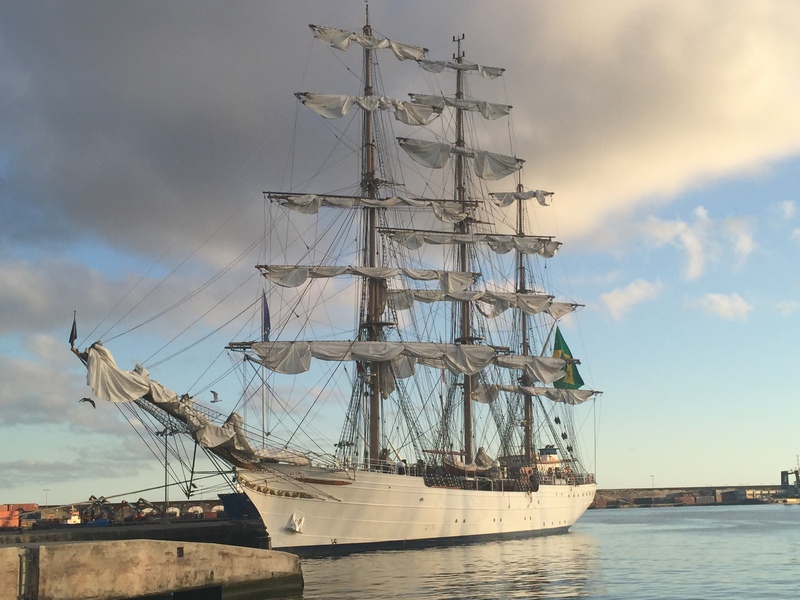 To go there, I chose to sail on a cruise ship, operating every two weeks from the main island: São Miguel. It stops at all of the islands of the archipelago and it’s prone to late arrivals, due to sudden, tricky weather conditions. When I boarded the ship in Horta (Faial Island) it was ‘only’ a few hours late and it took all night to arrive in Flores. The sea ride was rather shaky, but the inconvenience was well rewarded by arriving on the island exactly when the sun was rising! I can’t pick any words how beautiful was the view and the feeling of the remoteness of the island that appeared out of blue, in front of the ship. Those who arrive by ship usually land in the coastal town of Lajes, which is the main industrial port of the island. Lajes is also the Westernmost county of Europe, the next land at this latitude is Canada. I stayed at Residencia Matheus in the picturesque village of Fajã Grande, again the Westernmost spot of the island, infamous for difficult sailing conditions (for instance, RMS Slavonia is still wrecked close to the rocky peninsula nearby). It was close to various trail paths, within a walking distance from the lava beach, surrounded by the waterfalls and thousands of bird species which not surprisingly choose Flores for their nesting period. I was discovering the village in awe and was offered a very complex tour around the island with the local guide, Armando Rodrigues from Experience OC, who gave me some extra tips about not only natural wonders, but also places to eat out and enjoy the sunsets at the tip of the European continent. Flores is famous for its lakes, situated at the top of the mountain ranges, and is one of a few places on the planet Earth where there’s an excess of potable water. I managed to see all of the lagoas and admire the remote landscape from above, as the only other island spotted on the horizon is Corvo. And this was also the only failure of my stay on Flores; I planned poorly and did not manage to visit the neighbouring island of Corvo. The boats operating between Flores and Corvo offer very limited seats and can be sold out easily, especially if there are any festivities taking place (and it’s usually a case during the summer season). Instead, I took some time to discover the island on foot, and walk to the ancient and currently uninhabited village of Cuada, where there is a restaurant with a descriptive name: Por do Sol (Sunset). It offers the dishes typical of Flores, such as erva patinha – something I’d describe as algae ‘falafel’. After dinner, I contemplated sunset in a bar Maresia looking at the Atlantic depth with a glass of local wine, listening to great music played live from vinyls at the end of the world. In the night though, the only sound that one can hear are the chants of the Azorean squeeky bird: cagarros. Some like it, some freak out for the first days. Apart from the wilderness, the capital of Flores is Santa Cruz and it’s divided by a landing stripe, bordering the old town from the French quartier, established by the military stationing on the island since the 60s. The landing stripe is in use for the local SATA airlines, connecting Flores with Corvo, Terceira and São Miguel. I took some time to explore the local museums and was very impressed by their content and how many facts I’ve learned about the history of Flores and Corvo. On my last day, I was wandering around the town, waiting for the plane and looking at the depth of the Atlantic. I realized, many other travelers do the same, as the airport’s check-in area is accessible within 5 minutes walk from the beach. I was wondering about my fellow travelers where are they coming from, what they are, where are they going – quoting Gaugin, only that set in the Atlantic, and not Polynesian paradise. During the take off returning to Terceira, I had a chance to look back at most of the islands I’ve visited during my trip, and eventually managing to see the peak of Pico. I promised to myself to return, for much longer and I’m convinced I will keep my promise. Obrigada, Azores! This month I would like to look back at the island which attracts thousands of wandering sailors in the middle of the Atlantic Ocean: Faial. 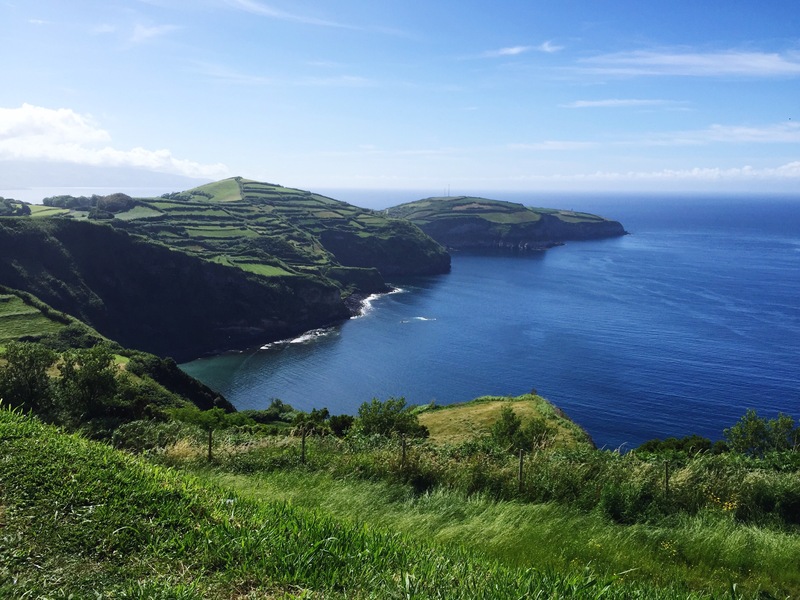 It’s located in the central archipelago of Azores and it takes roughly half an hour to get there from Madalena on the island of Pico. If you are lucky, you can see a disapperaing tip of the volcano as you cross to Faial. Or dolphins and whales alongside your boat! I spent a couple of days on Faial, namely in its capital: Horta and on the North-Western tip of the island in the romantic bay of Valadouro, known for its natural lava pools, lonely lighthouses and dramatic coastline leading to the Capelinhos volcano. Since this is an island of encounters, as a solo traveller I had so much luck meeting extraordinary people in various parts of the island, mostly while hitch-hiking. Digital nomads from Poland, refugees of the hi-fi civilization reconnecting with nature and living the life in accordance to minimalism/simplicity philosophy, sailors seeing the land for the first time in weeks or retired Azoreans returning from life-long migration in Canada or East Coast of the USA. I also had a chance to bump into some of my fellow travellers hopping the islands like me, only in a different order. During the time I stayed in Horta, there was a local festival called Semana do Mar, one of the most attended festivities on the archipelago. There I witnessed the relativity of what’s exotic: one of the most surprising attraction was to watch Slovakian traditional dances, something I found pretty surreal to see in the middle of the Atlantic. Everyone else seemed pretty amused though. Horta offers lively bar nightlife, with its famous gin & tonic at Peter’s Bar – a legendary sailor’s spot for encounters in the middle of the ocean. To be honest, its gin & tonic tasted exactly the same like anywhere else on Faial, the only difference was the spirit many sea life stories or adventures which are told on a daily basis at it’s counter. However, the cruising ship’s marina is not to forget. Thousands of paintings on its piers, done by the sailing crews from all over the world tell stories of distant travels, sea adventures and their original destinations. It was very emotional to me to see Berliner, Polish, Portuguese, Spanish or Brazilian paintings being so far away from my ‘homes’. Porto Pim in Horta offers a wide, white-sand beach and plenty of bars or restaurants, and is a great place to chill out after a whole day of (hitch)hiking and gin-tonic tasting. Unfortunately, I haven’t made it to the great caldeira – a crater in the middle of the island, given that I lacked not only time, but also food and water necessary to complete this 20 kms hike. I went on alongside the Westernmost coastline to the Capelinhos where one can walk at the verge of the volcano remnants and go underneath an impressive and interactive museum dedicated to… volcanos, lighthouses and planets, alongside with the geothermal history of Azores. I found this combination interesting at the beginning, but later it all made sense to me. Maybe it should be called a Principezinho (port. ‘Little Prince”) museum. At the end of my stay, I met various artists from the local Sociedade Filarmônica preparing for the annual parade in Horta. They all spent long days practicing their repertoire and choosing the clothes representing their local communities. I was very impressed during the whole journey, how important was to preserve local music, dances and craft on these remote and distant islands. After having visited Terceira, and São Jorge islands I departed on a shorter, 45-minutes passage to Pico, an island named, not surprisingly, after the highest Portuguese peak. Spoiler alert: I will not describe any hiking adventures in this post, as my feet were too damaged after hiking during the whole week and the weather conditions to approach Pico were unfortunately not good enough to risk it, even if it was early in August. Instead, I will focus on another way of discovering this island: on a bike. Pico is actually quite flat on the coastline, offering hundreds of kilometres of bike paths around the wineyards of the famous lava wine. Even though the days were very warm and humid at the coastline, the weather in the interior remained cloudy to the point I could only sneak peek the famous peak, and not the gorgeous mountain. I was much more lucky when returning on a small plane from Flores island over a week after though, where I could admire Pico from the bird view perspective. I stayed overnight around the major town of Pico: Madalena, rich in great restaurants and bars, some of them traditional and the others, with a fancy modern touch. Cella Bar located on the South-Western tip of the island, overlooking another island: Faial is definitely worth recommending for a romantic sunset with a glass of local wine. To be followed by laying in the hammock surrounded by the sound of nightingales that would never stop their love songs till the early morning. 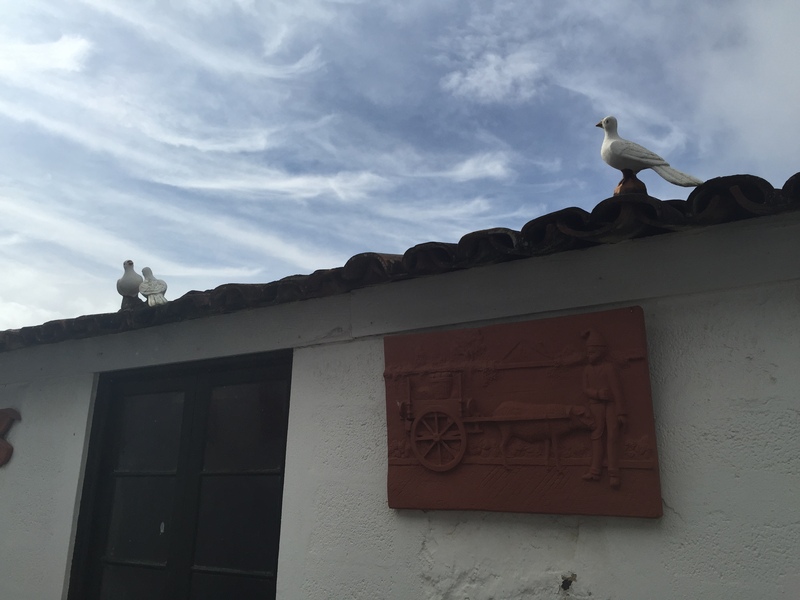 Wineries of Pico are listed on the UNESCO Heritage Site and there are two museums dedicated to the art of wine making. Another interesting fact is that the stray between the islands: Pico and Faial is very rich in whale and dolphin population, so one quite easily spot them while passing on the local ferry line. There various small villages and towns worth visiting on Pico: the biggest one of them are Lajes and São Roque. They are definitely more rural and sleepy, but have dedicated spaces for the local craftship and whalers. On the way from Madalena to São Roque one can pass by the formation of rocks called: cachorros (‘dogs’), due to their resemblance to a poodle. With wind in my hair, blue skies, ocean and endless green wineries in my eyes and wine in my head (only in tasting quantities though), I spent two days riding around the island on bike and would never forget this experience of careless freedom of discovery. 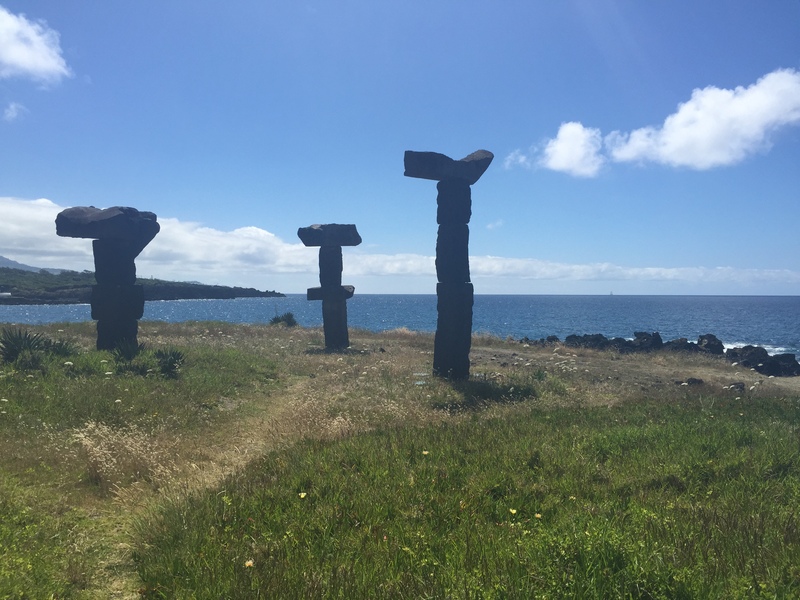 It’s high time to describe the next chapter of my Azorean adventure this summer, after my initial stay on Terceira, which is the Spartan-like hike around São Jorge. 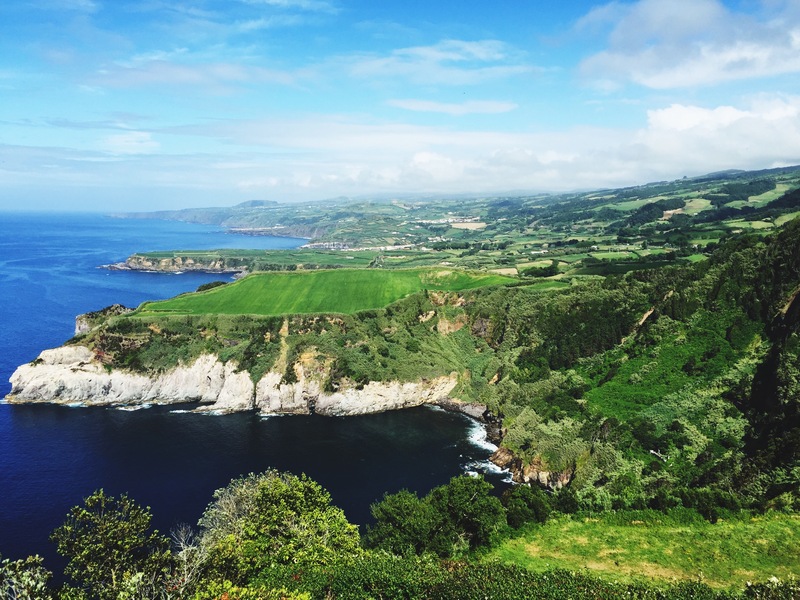 It’s one of the least visited, and challenging islands to discover among the Azores, yet I would definitely say: one with the most stunning wildlife and views. It is only possible to get there by a regular boat service during the summer season, given the roughness of the ocean tides, but there’s also a connection with the major airports of Azores by SATA airlines. São Jorge’s shape reminds of a dragon laying in the middle of the Ocean, as its steep volcanic mountain ranges create a landscape very similar to the one I described earlier this year in a totally different place on Earth: Dragon’s Back in Hong Kong. To see and experience the most of the island, I chose to hitchhike and hike anyway, often up to 1000 m up and down on the slippery, yet very picturesque slopes. What is very special about São Jorge is fajã – a lava-origined coastal structure, on the tip of the volcanic mountains, where natural pools (poços), lakes and little villages are located. The structure of fajã exists all over Azores, yet it differs a lot from island to island. That’s why visiting all of them can be such a great adventure! I chose to walk the Northern trail between Poços Simão Dias, Norte Grande, Fajã dos Cubres and Fajã de Santo Cristo, rich in the natural species like noisy bird-musicians: cagarros, sparkling waterfalls and flowers like conteira, brought to the island from Himalaya (! ), among the more endemic ones like cubres or hortensias. The weather changed every 10 minutes and so the visibility. I was often alone for many hours on the trail, making notes to self about the impossible to describe beauty I see, listening to the birds, wind and the ocean. It was a very transcendent experience to me, appreciating the time, space and surroundings that still exists very remotely on our planet. It took me some time to make a decision if to describe and publish the photos from São Jorge, as a part of me doesn’t want this place to be visited by anyone else, anymore. I know how unrealistic, and partly selfish this wish is though. So, take your time, enjoy, and smile to yourself. Again, I can only appeal to discover places like these in a respectful way for the nature and local culture, and for now it looks like the visitors comply with it. I left São Jorge with tears of joy and instant saudade feeling, promising to myself to return, possibly for longer, to lose the track of time, space and simply indulge in the natural beauty. Não adianta chorar. On the board of Gilberto Mariano boat (again!) I could see the peak of the island Pico (which, not surprisingly, means ‘the peak’ in Portuguese and its volcano is indeed the highest mountain of Portugal! ), where I spent the next couple of days. 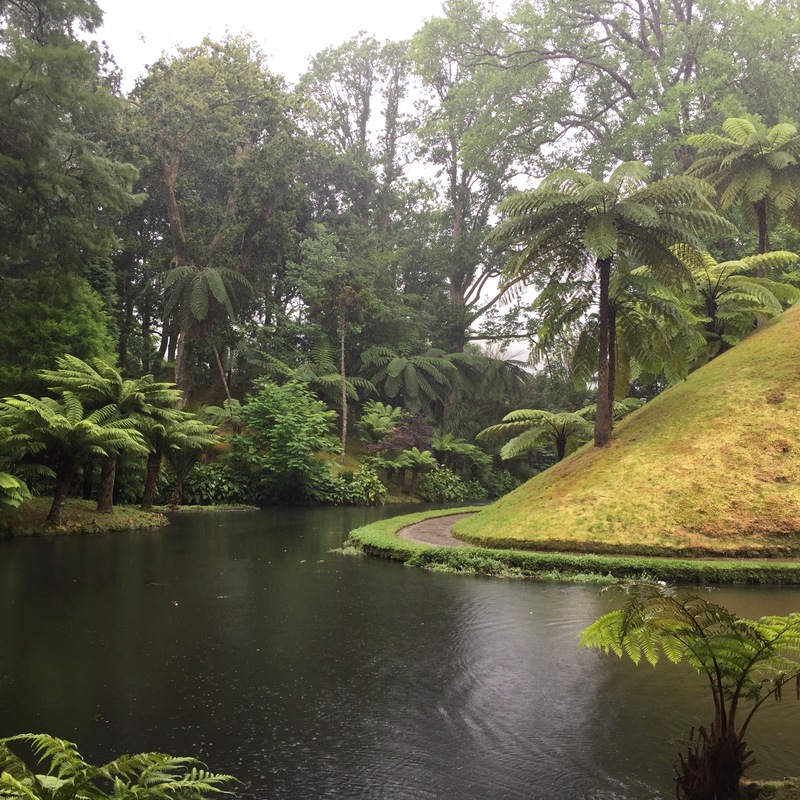 After visiting São Miguel – the biggest island of Azores, I promised to myself I will return one day to discover the rest of this incredibly beautiful and remote archipelago. This year I had enough time off to plan a trip around five other islands: Terceira, São Jorge, Pico, Faial and Flores. I took thousands of photos and collected unforgettable memories which I will hopefully share in the course of the forthcoming weeks. I will start with Terceira, which was the first (and not the Third – as its Portuguese name says!) island I visited this year. How did I get there? 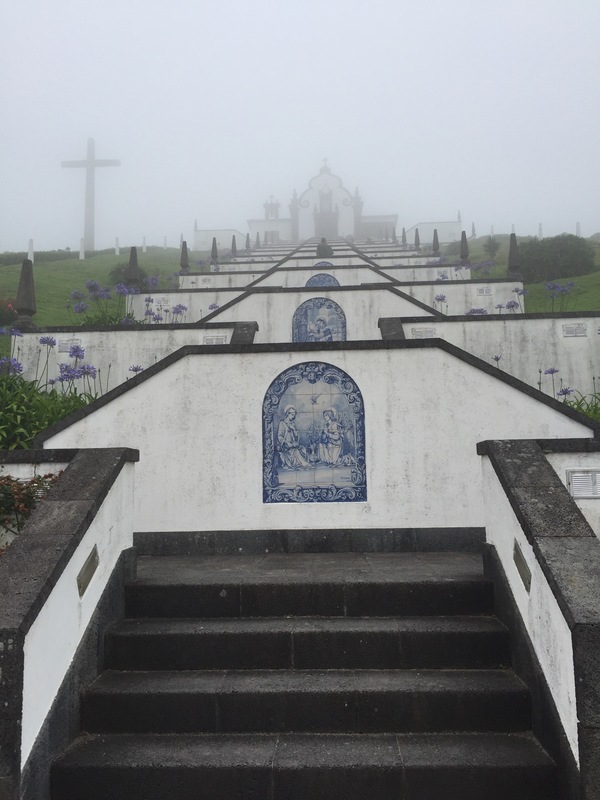 Terceira, similarly to São Miguel, opened up its runway to cheap airlines and is one of the connecting airports if you want to go to the more remote parts of Azores with their local provider: SATA. It’s fairly well connected with mainland Portugal, as well as USA and Canada. Aviation is very well developed around Azores, since the sailing conditions may be too hazardous during the winter season. The closest town next to the airport (‘aerogare‘ in Azorean dialect) is Praia da Vitória, a lively and probably the most touristic municipality, with a wide, white sand beach. I was lucky enough to take part of the Festas da Praia, famous festivity around the month of August. Some of the highlights were traditional touradas, gourmet food fair offering tastes of the Atlantic cuisine and folk dances from all over the world (for some reason Eastern European bands were very popular this year!). I later learned that I could spot similar kind of parties on each and every island I visited. This one is pretty big though, apparently! I drove around the coastline of Terceira and stayed in the lovely town next to the capital: Angra do Heroismo (‘The Bay of the Heroism’). As the UNESCO World Heritage site, Angra is full of history, nature and culture (and stunning street art too!). One can easily spend two days just walking around sites like Monte Brasil, the largest crater mountain with the green caldeira transformed into an open air amphitheatre these days, or winding, colourful streets, botanic gardens and drink cafezinhos (tasty and famous Portuguese espresso) in the local pastelerias. I stayed at one of the Portuguese youth hostels branch: Pousada da Juventude which is one of the best accommodation options around the country. The quality/price ratio is amazing, and the best thing is that if you travel alone – as I often do, you can meet like-minded travellers and exchange tips/share transportation/simply meet interesting souls. Since it’s not the most crowded place on Earth though often, you can find yourself alone with your thoughts (if you don’t count in the cows which are all over the place! ), looking at the most stunning sunsets, listening to the waves and the sounds of the marine birds: cagarros. On the northern coast of Terceira, there is a natural lava pool site, Biscoitos. It was one of the first ones I visited and I loved the natural sustainability concept: high waves enter the basins where everyone can peacefully swim and enjoy the fresh Atlantic waters. 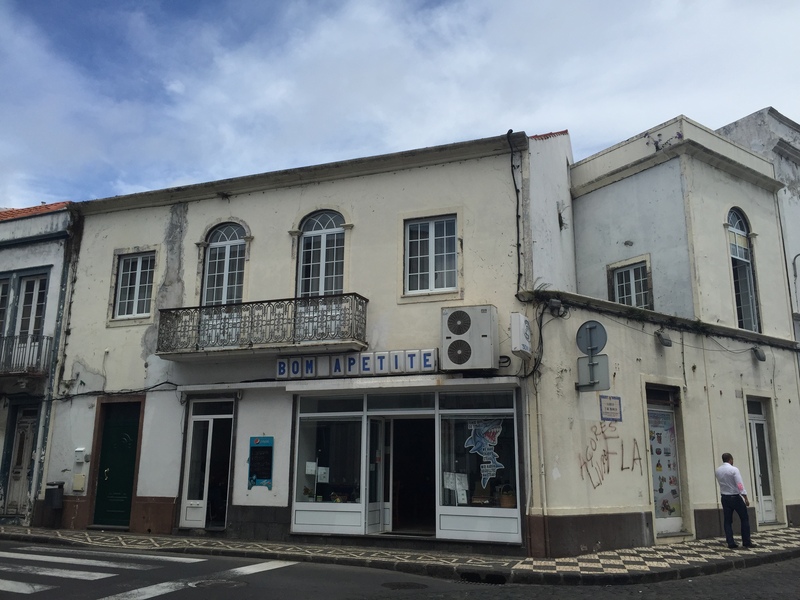 It was here where I tried one of the Azorean treats for the palate too: lapas grelhadas, a species of grilled oysters, and enjoyed some fresh kiwi/avocados/maracujã desserts. I have a guilty pleasure of visiting the bars at the end of the world, so I also made friends at a local motorcycle club. Guess, if it turned out we have some friends in common in a small town of Algarve! 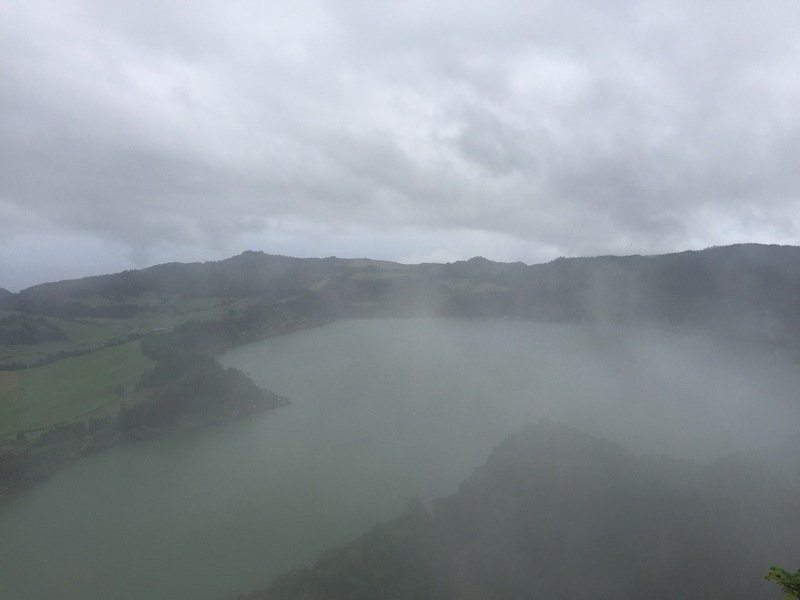 Since Azores are made for the travellers who are not afraid of constant weather changes, including very strong winds, the following day I experienced mist/rain/sun change spells every couple of minutes and it was actually an amazing weather for the hike around the natural park of Serreta. 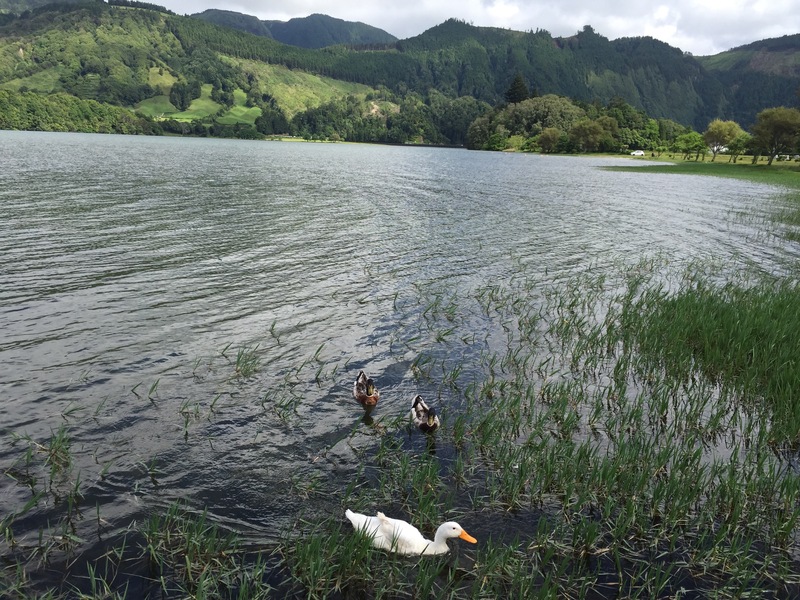 Serreta offers hiking trails around the dense Atlantic forest, hidden lakes and panoramic views (when the mist is gone), as well as some hidden treasures like duck fountains in the middle of nowhere. Even though I heard that Terceira is becoming increasingly touristic and is not as ‘wild’ as the other islands, it impressed me greatly. I stayed there for three days in August and there were days I met no one at the hiking trail. Elsewhere, the people I met were incredibly respectful for the nature, and the local community. Let’s preserve it this way! During my last hours waiting for the boat to take me to São Jorge, I hang around Angra, tried local specialty: alcatra (try it only if you love meat… and meat only) and found a book that marked the rest of my journey: Homer’s Odyssey. Then I boarded Gilberto Mariano boat and sailed through the windy Atlantic Ocean for the first time, which was quite an experience itself. Soon to be continued. During my latest journey to Asia, I took a chance to visit Taiwan, mostly its Northern part and its charming capital: Taipei. By reading more about this beautiful country, I realized that it is heavily influenced by Aboriginal culture and when Portuguese set foot in Taiwan for the first time, they named it ‘Ilha de Formosa’. 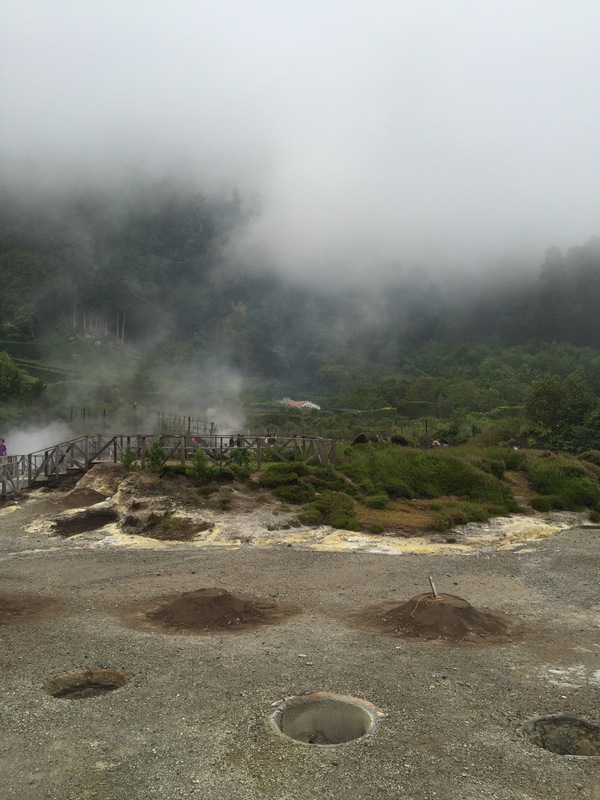 In this post I would like to focus on the town of Keelung, Yehliu Geopark, Pinglin and the Thousand Island Lake, as these are the short getaways I made within the Northern part of Taiwan. On the way to Keelung, I stopped at the Da Fo Buddhist Temple which amazed me by its authenticity and colours. As well as some quirky, almost ‘kawaii’ elements, which were remarkable along the town. However, I learned from the local guide that Keelung has lost its prosperity. In the past, it was one of the main port entrances to Taiwan and in the times of airplanes, it has lost its strategic meaning. Another wonderful and tranquile place to visit is the Thousand Island Lake. Obviously, I could not name all of the islands, but it has quite a winding and challenging trail where chances are, you will not meet any visitors (if you go early enough), except from the birds, or the dogs. In the surrounding villages the locals can offer a tasty breakfast options containing eggs boiled in tea with mushrooms (and that turned out to be one of the best culinary surprises for me!). Further up North there is Yehliu Geopark where erosion and sea tides have shaped an amazing, almost Martian landscape on the coastline. If you look closely enough, you will notice fossils aged millions of years or junctions, since Taiwan lays on a quite active spot on one of the Mother Earth’s tectonic plates. I was particularly amazed by the flowers looking like shrimps or other sea animals I can’t name, as if the shape of the nature was inspired by the surrounding ocean. Who knows? Last but not least, the Oolong Tea. And a few more types, including the ‘Grasshopper’ Tea which I was lucky to try during the traditional Taiwanese tea ceremony in Pinglin, a picturesque town laying in heart of the evergreen plantations. I can’t get out of my smell memory the first cup of ‘testing tea’ – it’s like a perfume. Enough saying that since I brought a lot of tea from Taiwan, I cut my daily coffee intake by half. And that means a lot! I am already missing this place and look forward to discovering more of this part of the world, maybe later this year. This part of Taiwan reminded me a lot of peaceful islands of Azores which I may revisit soon, again. This is my last post (for now!) about the paradisiac island São Miguel, the most accessible one from the Azores archipelago. I have already written about its very special capital, and about the inland treasures. 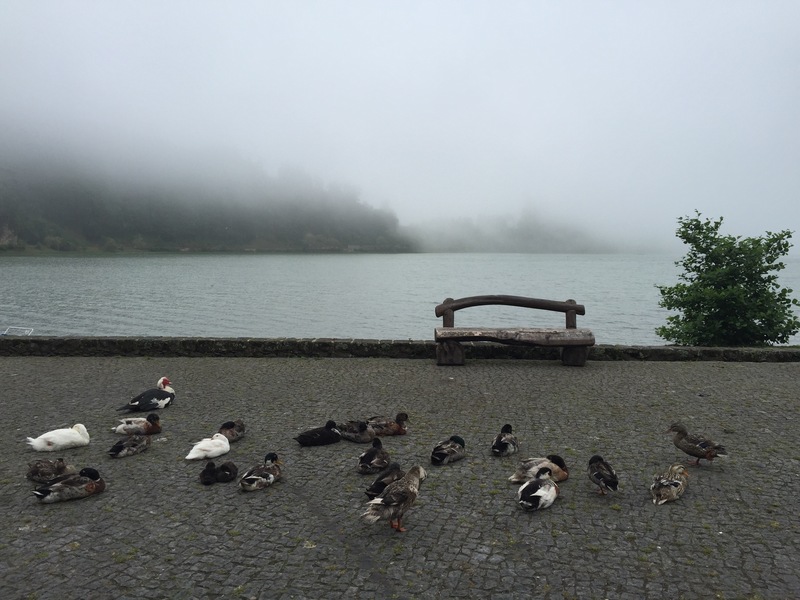 There is probably much more to write about, but I deliberately would like to leave the pictures taken in Sete Cidades (“Seven Cities” in English) and on the shores of the island to speak for themselves. Panoramic view over Sete Cidades and its Green and Blue Lake (Lagoa Verde and Lagoa Azul). The name of the town comes from the times of building a sustainable, democratic power in this part of the island, taking the votes of São Miguel’s seven cities representatives. Sete Cidades is located in the westernmost part of the island, in the picturesque setting of the crater lakes. The difference in colours comes from the fact that one is more affected by the algae. However, the effect is indeed magic, and could probably be a great Portuguese candidate for the Seven Wonders of the World. On the northernmost shores of São Miguel one can experience equally breathtaking views and try tea or pineapple from the local plantations. 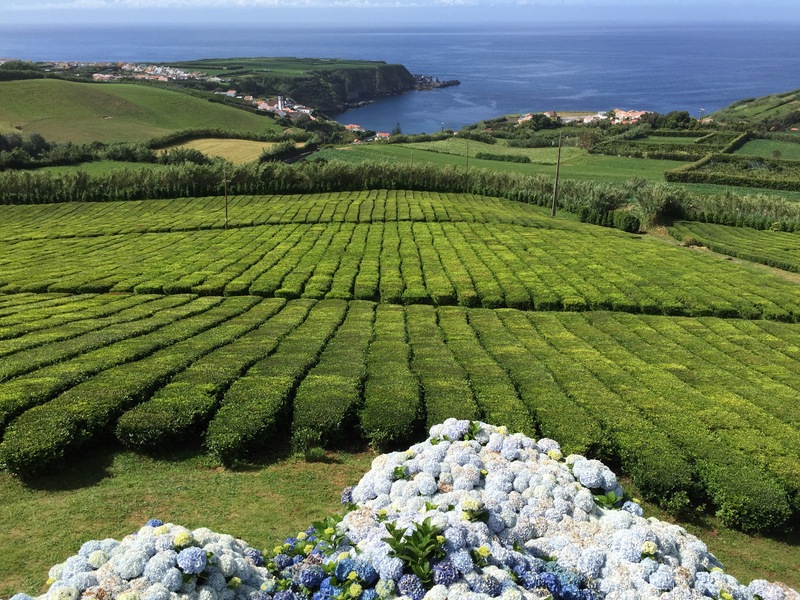 Actually, Azorean tea is the only one remaining old-fashioned producer in Europe. The delicate taste of Cha (eng. tea) Gorreana reminds me of this wonderful trip anytime I drink it back at home… To finish off this chapter, I would like to share my last moments on the Northern tip of the Island, where the peninsula is funnily shaped like a tartaruga (eng. turtle). I did not say ‘adeus‘, only ‘ate logo’. Next time I’ll visit Azores, I’ll try to sail or fly to the smaller, less accessible islands, I’m sure it’s worth to touch again this piece of paradise in the middle of the Atlantic Ocean. São Miguel is not an island for lazy bones. The island has its unique microclimate, varying from tropical, to moderate and windy at the coastline. 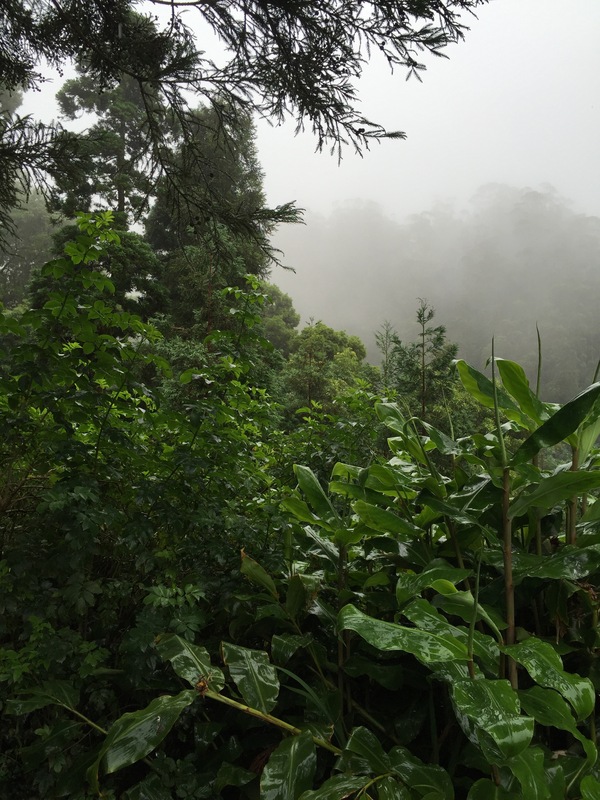 While visiting the inland of São Miguel, make sure you go prepared for 7 seasons! But most importantly, prepare for breathtaking views and picturesque landscape, which is still not empoverished by the massive tourism presence and is ideal for a day-long hiking. 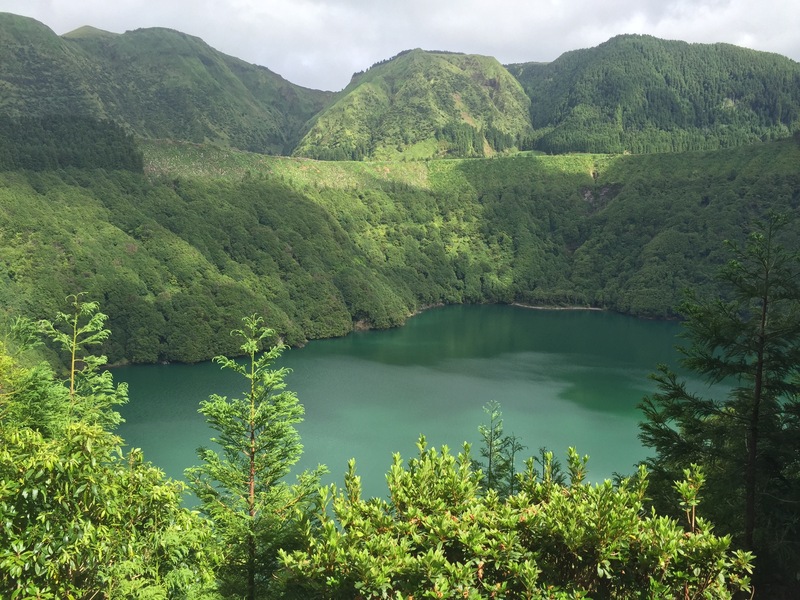 Given its volcanic origin, one can find various crater lakes which can be reached by winding roads from lovely and so unpretensciously named towns such as: Ponta Delgada (“Thin Tip”), Rabo de Peixe (“Fish Tail”), Ribeira Grande (“Great River”) or Furnas (“Heater”). 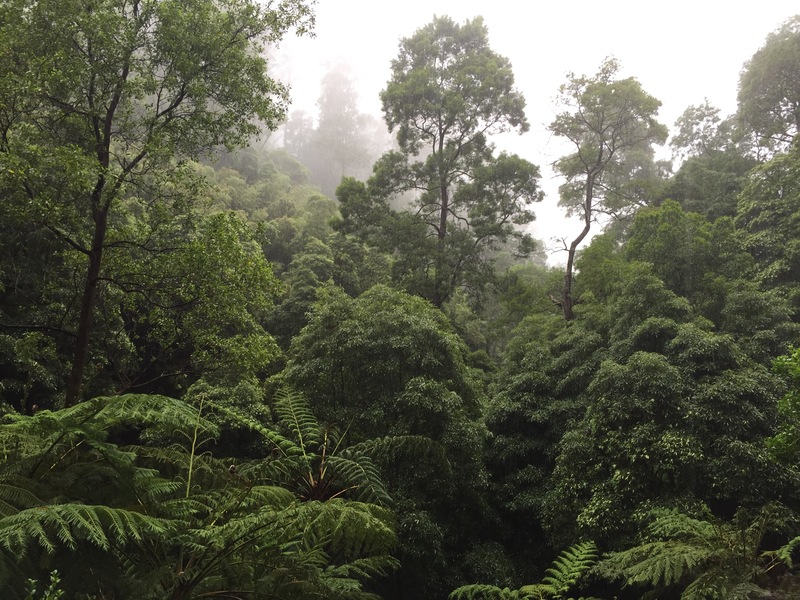 The truth is, it can get very warm and humid when you enter the green forests on the sleepery hills. When the rain caught me on the trail to Caldeira Velha (definitely my fave name “Old Boiler”), I did not think twice to jump in the hot spring. 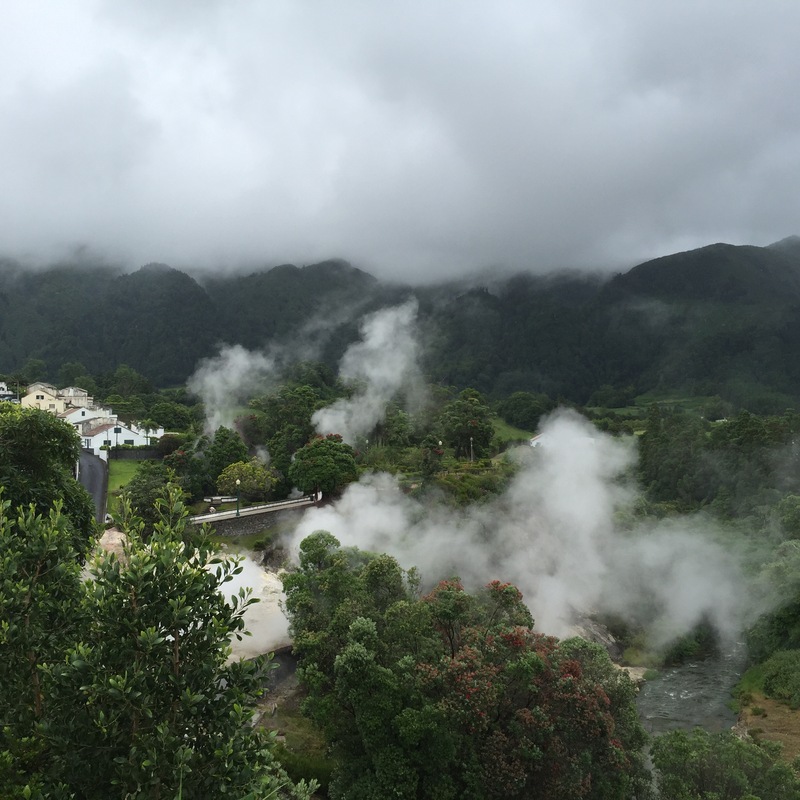 Hot springs, full of iron and other minerals are a free retreat offered by Mother Nature on this heavenly island. 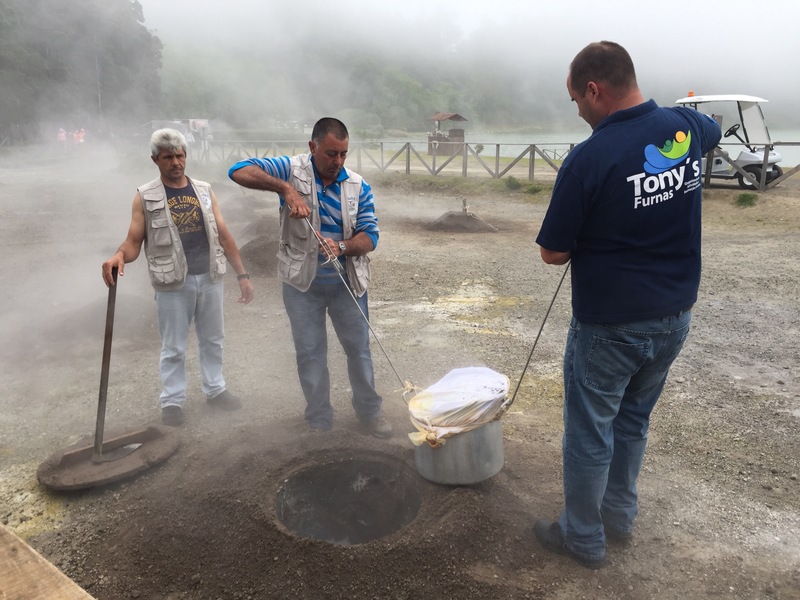 Another interesting fact is that in Furnas, the typical dish called cozido (“Cooked Meal” – another brilliant and self-descriptive name!) is prepared… below the ground. It takes about 8 hours to prepare a dish consisting of various types of meat and vegetable stew buried in a huge metal pot. Yes, exactly like this one. Inside, the geothermal temperature goes up to 90 degrees Celcius, offering fantastic conditions to cook a very delicious stew. The inland hills and roads are also very mystical. Almost all the roads are naturally decorated by hortensia (eng. hydrangea). The reason for it is also pretty simple: once upon a time, man discovered that cattle somewhat hates the smell of it. By planting it by the road, he made himself sure that the cows won’t be passing it. 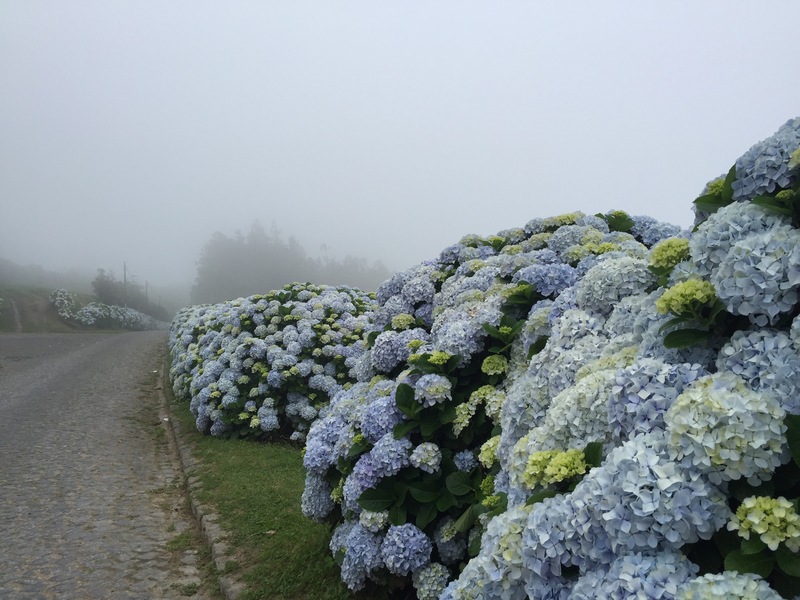 By now, these beautiful flowers grow almost everywhere the roads of the island, making São Miguel a particularly picturesque place to wander around and never come back. Ponta Delgada means literally ‘Thin tip’, and is a capital of the enchanting archipelago of Azores I was lucky enough to visit a few weeks ago. But don’t be mislead by the name: its airport is definitely not such a thin stripe as the one on the Madeira Island and is already pretty busy. 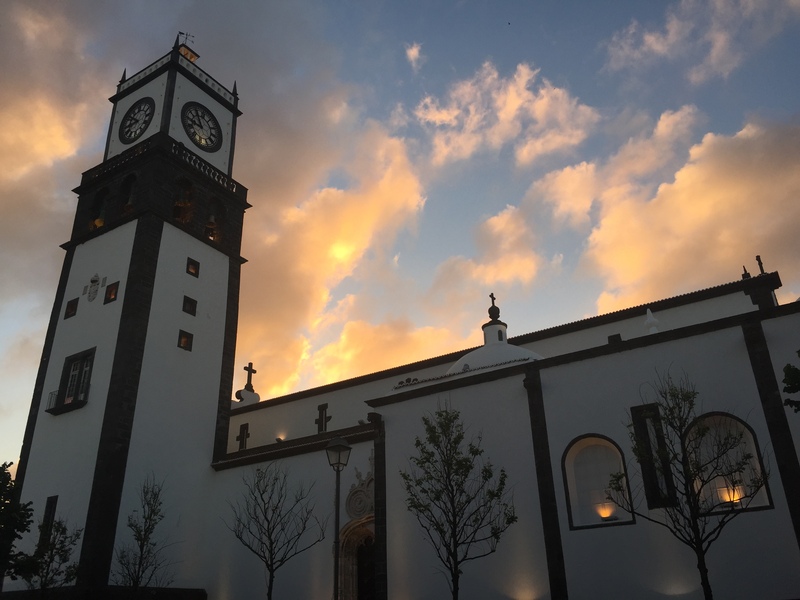 Ponta Delgada can be reached with the direct flights from Oporto, Lisbon, London and Amsterdam, and also from the other side of the Atlantic Ocean. 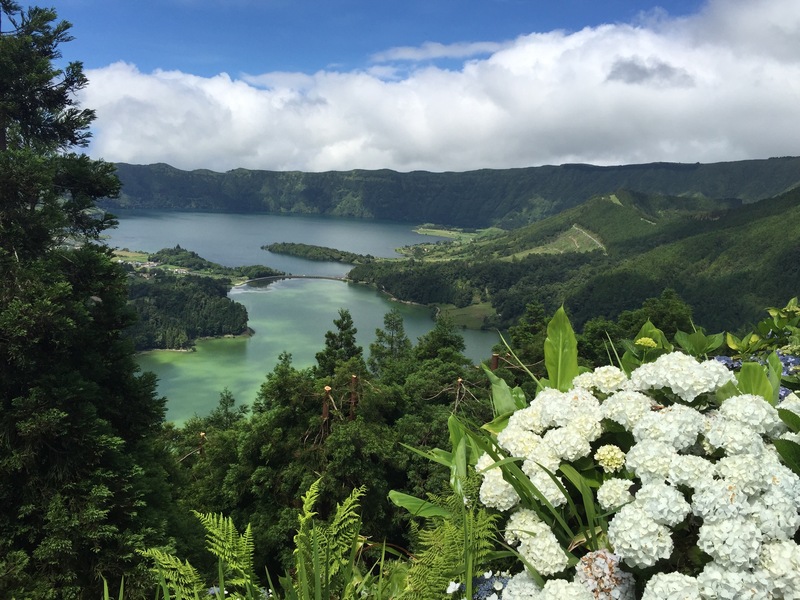 Since it’s the first year of having the low fare airlines operating to Azores, the question is: for how long will the islands stay so peaceful and conserve its remote charm? It is true that there are three times more cows than inhabitants of the São Miguel Island, still being the biggest one of the Azorean archipelago. 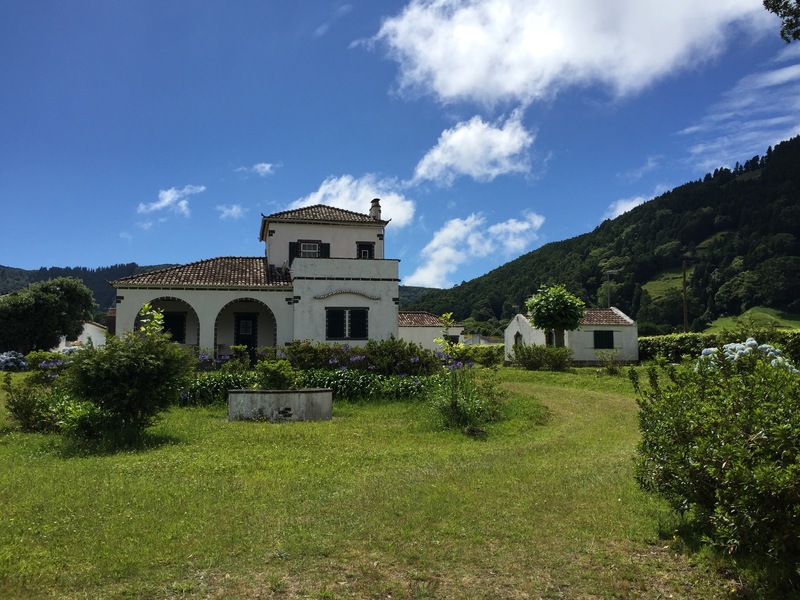 There are not too many hotels, or pensions (I stayed at the Azorean Urban Lodge, and recommend this experience very much!). However, it already looks pretty welcoming and offering a great deal of the infrastructure, including organized trips, hikes and excellent cuisine to the visitors. Some parts of the city look pretty abandoned, given the historical emigration rate, mostly to the East Coast of the US and Canada. Some buildings revive its ‘2nd life’ though, given the art-friendly policy of the city. 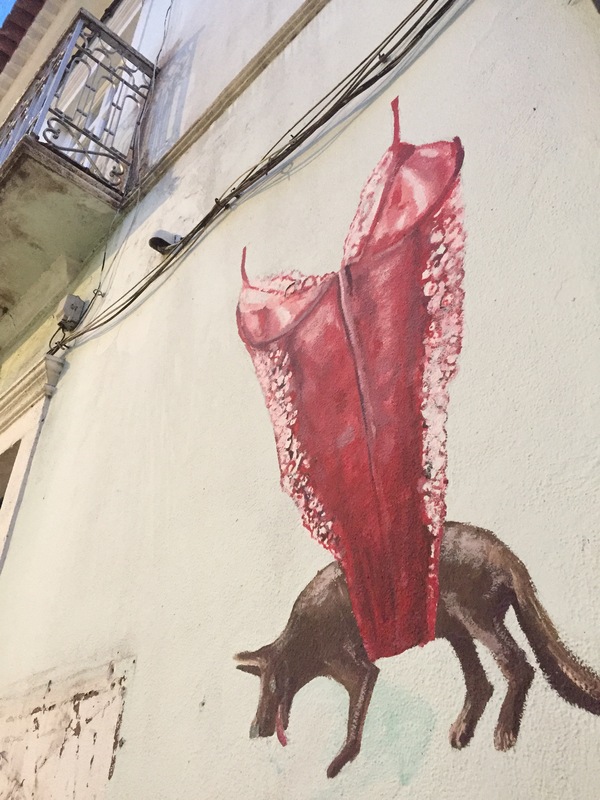 Don’t be surprised if you notice some popular mural painters’ art on a random backyard street. Or if you see the endemite trees imported from the New Zealand during the colonial times. Expect the unexpected! 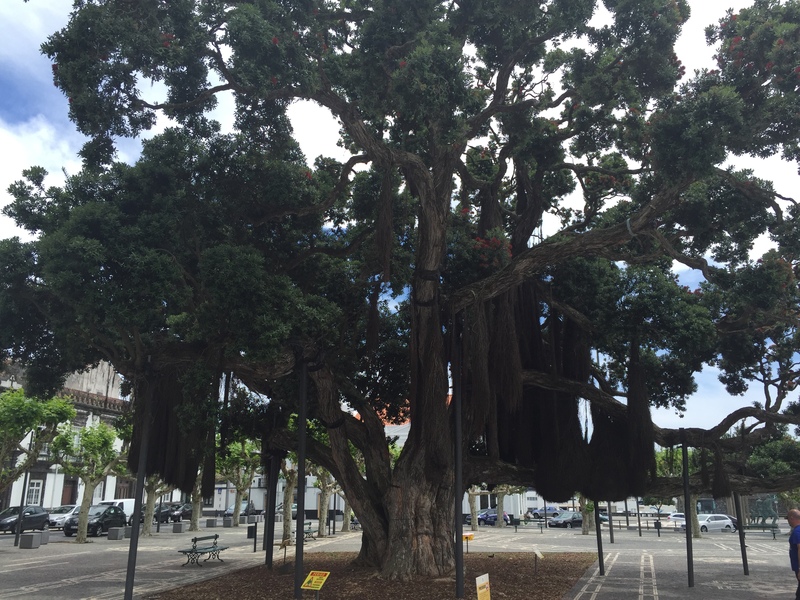 Nature and art, in a peaceful cohabitance, make Ponta Delgada a very special place. 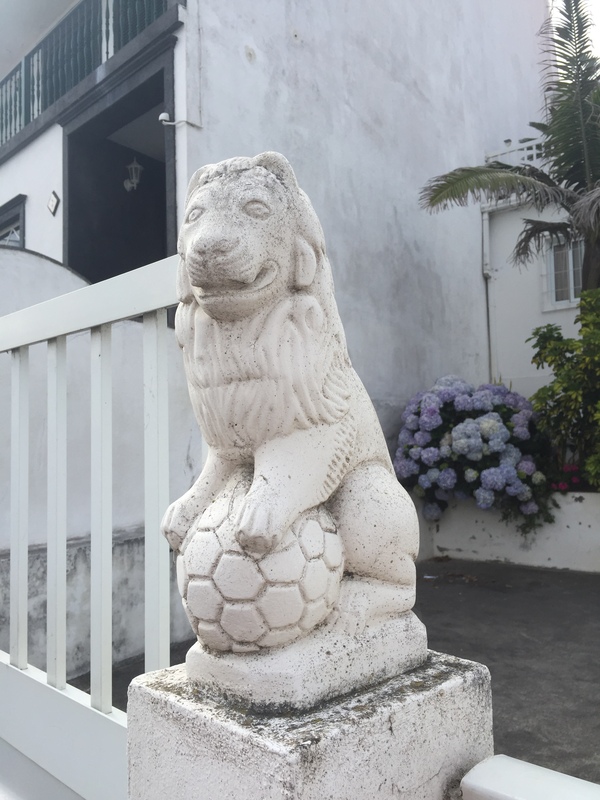 Be it Rainha das Bifanas (‘The queen of the beef sandwiches’ – very popular Portuguese dish), the ‘Lion King of Football’ (very popular house decoration) or a fancy mural. This coexistence of different styles, climate (be prepared for weather changing few times per day) and cultures makes this town very special, and hope that this will stay so charming regardless of the massive tourism knocking at its door. Just a quick heads up: I will be back again in Lisbon already this Saturday. I am more than happy to re-visit one of the cities that made great impact on my life and stayed always very close to my heart and soul. I am even happier that I will be able to participate in the Santo António celebrations which take place in the month of June all around different neighbourhoods. I always enjoy the landing in Lisbon, as the plane normally takes a round around the Tejo river, the massive port entrance and flies just above the picturesque city centre. It wasn’t so much fun when I was living in Entrecampos neighbourhood for a while, as the air traffic is quite heavy and every couple of minutes a plane lands or takes off. But that’s not the end of this year’s adventure. I am heading to the mid-Atlantic located Sao Miguel, the island from the Azores Archipelago. It was one of the dreams I had, to visit this remote, and still not too touristic place, full of natural wonders and amazing heritage. I will keep you posted about my stay there sometime in July, when I am back. I dedicate this, perhaps a little bit naive, but how lovely, summery track to my long-awaited holidays, and to my beloved Portugal.